Connect your Quick Base applications to world class analytics with Tableau. Start now for $49/month for unlimited use for 1 user. Create as many reports as you want in Tableau. Use in conjunction with Tableau Server, and schedule extracts. Connect your Quick Base app to the Web Data Connector. No passwords, data, or tokens are saved on our end. Open Tableau and connect to your own custom URL. Enter your token, and start working with your data. 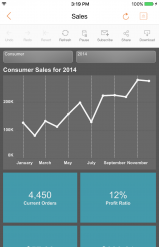 Build, share, and utilize Tableau dashboards as you normally would with any other data source! "We've always relied on the flexibility of Quick Base, but now we can pair that with the analytical horsepower of Tableau." You already have the flexibility of Quickbase, now add the awesome power of Tableau analytics by connecting the two. © 2017 smblytics llc. All Rights Reserved.